5th class have been learning about the vikings. Everyone has been doing their own projects on paper or presented on a USB. We’ve learned lots about their customs, how they ate and their language. The class worked together to make a Viking shields and a giant viking longship collage in our art. Each class is taking on the Sights of Europe Running Challenge, trying to reach landmarks such as Big Ben, Leaning Tower of Pisa and Prague Castle. Each lap of the school yard is 1km and classes are trying to reach their destination before this challenge finishes at the end of the month. Keep running! We, Fifth Class went to the RDS, Dublin for the ESB Science Blast on the 6th of March. We has our own display area and learned a lot from doing this project and looking at others. Did you know that 75% of people buy their fruit and veg in plastic waste, and only 9% of that is recyclable? We were shocked by this and wanted to make a change. Our project title was ‘Are there alternative ways to package fruit and vegetables in an effort to reduce plastic waste’? Our conclusion was YES! There are many alternatives. After completing surveys, writing to supermarkets, researching, designing and making and writing our results in graphs, we came up with solutions for this waste like a recyclable and re-usable cardboard banana holder, boxes and materials that could be composted for holding fruit and veg. We are trying to spread our message through our motto ‘1 less plastic, 1 less waste’. We got great feedback from the judges. We included everyone, we even won a trophy! We loved the project and the RDS was a great day out. As well as a chance to look at the other exhibitions,there were shows put on too, demonstrating science experiments. It was a great day overall, and we would recommend it for other schools too! We encourage all parents/guardians to view this power point presentation. This power point has been developed for parents by Webwise. Please take the time to view this. 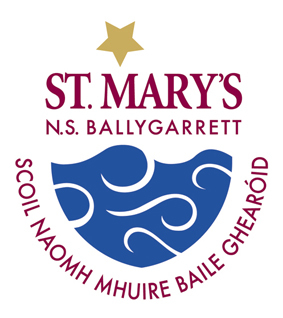 We are a group of four pupils from 4th, 5th and 6th class in St. Mary’s NS, Ballygarrett. We meet with our teacher Mrs O’Sullivan every Friday for our computer class. During this class we practice typing, online research, working with Microsoft word and using powerpoint. When we heard about the ‘Pasture to Plate’ project we decided to enter the competition. After some discussion and research we decided to use the produce from a local Buffalo Farmer to make ‘Bionic Ballygarrett Buffalo Burgers’. We used locally produced ingredients where possible and we are very happy with our recipe! We hope you enjoy reading the projects which we put together using poweroint! The burgers were delicious!!! Please see below a copy of our CSS Review Notification. Congratulations to our Boys Rackard League Football panel on winning the Gorey District this year. It has been eight years since Ballygarrett/Riverchapel last captured the trophy. Our panel of 32 players have trained very hard and applied themselves excellently to training, games and competitions from the beginning. In ahighly entertaining final, we defeated Kilrush on a scoreline of 3-6 to 2-4 on October 17th in Naomh Éanna. A repeat of last years’ final that delivered an enthralling game from start to finish. After all the celebrations had quietened down, the team then represented the Gorey District in the county semi final and were beaten by a very strong Oulart team in the end. The team played with great spirit and determination throughout the year. Thank you to all our players and their parents from 4th, 5th and 6th classes. Thank you to all our teachers and coaches from both Ballygarrett NS and Riverchapel NS for their volunteerism and effort throughout the term. We now look forward to working with our Development Squad in the coming months!